We would like to show you really nice piece of interesting resume that comes in black and white colors. 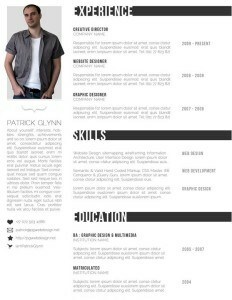 It is a simple black and white resume that has clean style and can be easily fitted to one page. But even though it is a single page design, you can manage to fit all your necessary profile information there. You can insert a huge amount of personal information, information about your experience and education and so on. On top of it, there is a space left for your profile picture, place for your introduction and place for basic contact details. This resume template is, of course, easily editable because is created with the use of layers in Photoshop. It is really easy to work with and you don’t even have to be skilled IT person with Photoshop skills. Just download and use it 🙂 It is also necessary to mention that template uses two extra additional fonts – Raleway and Bebas Neue. Apart from the two font sets, it also uses a special set of icons taken from Icon Finder. If you would like to visit authors website of this template visit the link in the downloaded file. What do you think about this black and white resume template? Do you like it? Or do you prefer different kind of template designs? Please share your thoughts with us on our social media channels. Every kind of feedback is really appreciated because it can help us to move forward. Thank you very much for reading and have a nice day.